The bench press is your core upper body lift for building pressing strength. Correct technique will lead to a bigger bench press, you should be performing an exercise this important correctly. The bench press is one of your big three compound exercises (the other two being the squat and the deadlift). The bench press primarily works your chest. Your triceps are also key to the lift, as are anterior delts, and your lats biceps as stabilizers. Lie on the weight bench with your head, shoulders and buttocks in contact with the bench. Your feet should be flat on the floor. You should retain this position throughout your lift – none of the contact points should shift during the bench press. Your grip on the bar should be wide but comfortable. Grip width: Use a grip so that your forearms are perpendicular to the floor when the bar is at your chest. Gripping the bar at shoulder width or narrower is considered a close-grip bench press. Thumbs: Wrap your thumbs around the bar for safety. Bar placement in hand: The bar should rest on the base of your palm, with the force of the bar driving down directly through your wrists and forearms. Resting the bar higher in the palm will place unnecessary strain on your wrists. Squeeze your shoulder blades together tightly to engage and tighten your lats. Drive through your feet, pressing your glutes towards your shoulders creating an arch in your back. Using these techniques, your entire body should be very tight from your knees to your traps. 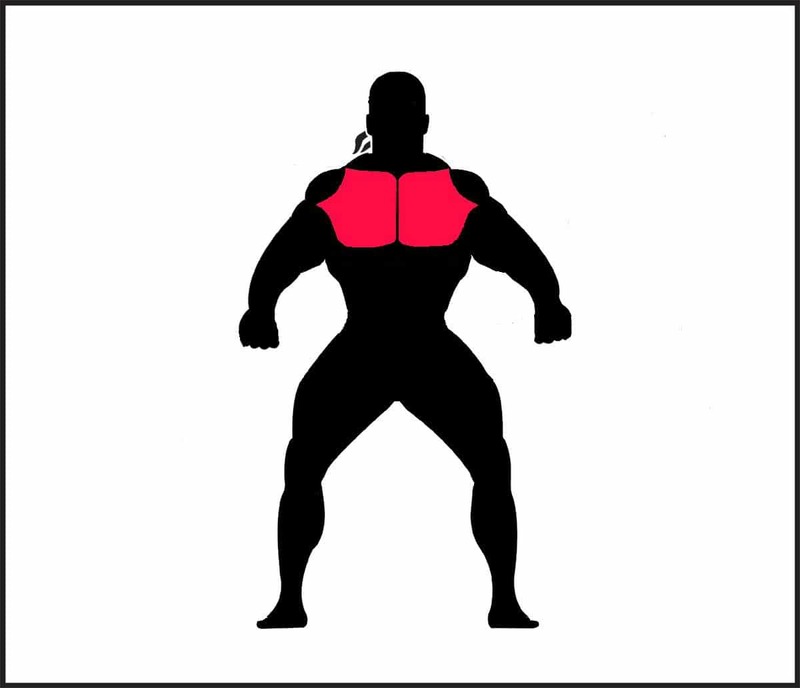 Maintain this tightness throughout the lift. Take a deep breath and hold it, giving your upper body more stability as you bring the bar out of the rack. If you have an adjustable bench, set it so you can nearly lock out your elbows before unracking the bar. If possible, you want to bring the bar straight out over your chest, versus lifting the bar up and out. Lock out your elbows, and make sure you have control the weight before starting your lift. Take a deep breath into your lungs and hold it. This will give you much greater stability in your chest. If you breath in while you are lowering the bar, or when the bar is at your chest, you will be unable to fill your lungs with air. Exhale as you press the weight back up, after the bar has reached and is passing your sticking point. Note: When lifting lighter weights (ie greater than 5 reps per set), you can relax the strictness of your breathing, and breath in and out throughout the reps.
Bring the bar down to the lower portion of your chest in a controlled but quick manner. Bring the bar to a complete stop before pressing, but do not allow it to sink into your chest. Do not bounce the weight off your chest. Press the bar off your chest explosively using your chest and lats. Continue pressing until locked out again. Pause briefly between reps and take another deep breath and to ensure you have complete control of the weight. For safety, always use a spotter when performing the bench press. Using your spotter to hand the weight off to you can allow you to conserve your energy for the actual lift and enable you to press heavier weights. Incline Bench Press: targets the upper portions of the chest and the shoulders. Dumbbell Press: forces you to control the weights and can help you develop stabilizer muscles.